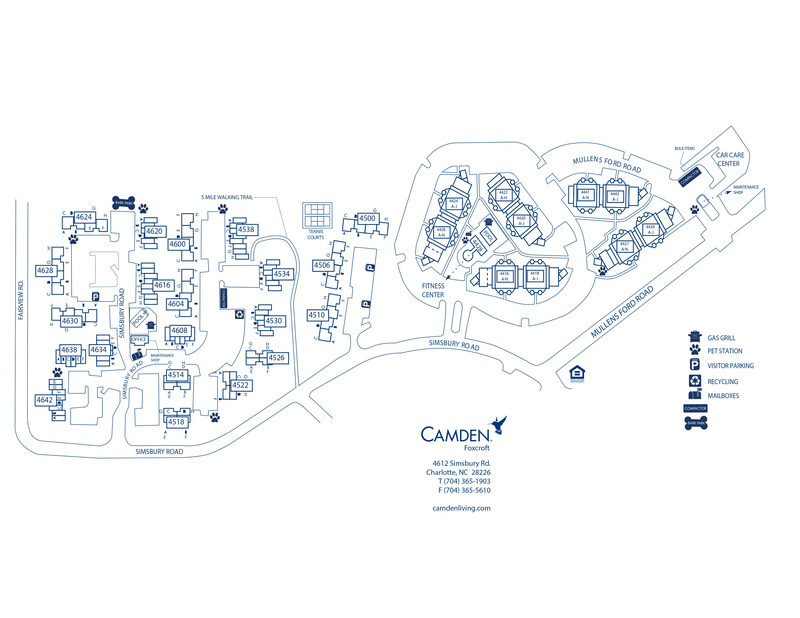 Enjoy the unparalleled location in SouthPark Charlotte and luxury apartment living at Camden Foxcroft. Our pet-friendly one and two bedroom apartment homes and lofts are just minutes from your apartment you’ll enjoy great shopping and restaurants at SouthPark Mall and Phillip’s Place. Even better, Uptown Charlotte is only 15 minutes away! View our available floorplans. For your apartment home we have the perfect layout to meet your budget, needs and wants. Choose from spacious one or two bedroom floor plans complete with washers and dryers, walk-in closets, upgraded lighting and hardware and private patio and balconies. Select homes feature stainless steel appliances and fireplaces. Love a modern apartment-style with custom cabinetry and stainless steel appliances? We've got those too! Enjoy the two resort-style saltwater swimming pool with sun decks, hang by the picnic area with grills, or play some Tennis on our courts. Stay in shape with the 24-hour fitness center or utilize the 5 mile walking fitness trail in Foxcroft East neighborhood. Get down to business with the car care and maintenance center or the onsite laundry center for those oversized loads. We even have a private Dog Park for our four-legged residents! Camden Foxcroft is also currently in process of becoming a completely non-smoking community. When it’s time to venture out of your SouthPark apartment, enjoy life on the edge of all Charlotte has to offer. Located in the prestigious SouthPark area and part of upscale Foxcroft East neighborhood, the Foxcroft East Shopping center is right across the street with Brixx Pizza, Ben & Jerry’s Ice Cream, Wine Shop and Caribou Coffee. Convenient to the Charlotte nightlife in Uptown and Montfort Drive your options are endless! Enjoy being a 5 minute drive to SouthPark Mall and Cotswold Shopping Center, a few minutes from Harris Teeter, Publix and Fresh Market and only a short commute to Uptown, Pineville and Charlotte Airport. Welcome home to Camden Foxcroft. At Camden, your pets are family too! We welcome cats and dogs, up to two pets per apartment home with no weight limit. Call us with any pet-related questions! We'll save a spot for you! We offer two parking spaces per apartment home.